The essence of coming to God is worship. The purpose of coming to God is worship. By producing our first CD we have given you another opportunity to worship. Our purpose is not to entertain or try to impress you, but to lead you and join you in worship and praise “in spirit and in truth.” We worship Christ in spirit, that is, in our spirit, motivated by His Spirit. We worship Jesus by knowing the truth about ourselves as desperate sinners, in need of Him alone to save us and to change us into His image. We worship the Savior in statements of faith songs such as We Believe and Cornerstone or when reflecting on His sacrifice and suffering in songs like Is It I, Lord? and How Deep the Father’s Love. We worship His Lordship in songs of commitment, like Christ Alone and At Any Cost. The Father is seeking this kind of true worship. The New Life Singers are an extension of Calvary Baptist Church of Smyrna, Georgia. 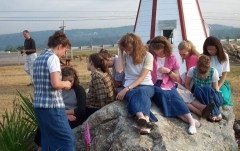 The group began in 1999 to travel on a missions trip to Canada with Evangelist Don Currin. On the way they sang in churches every night. Once the team reached Canada they sang in a different church every night for two weeks and sang in more churches on their way back to Georgia. Since then we have taken a second ministry trip with Brother Currin, up the East Coast through New England to Canada, this time staying in two different churches for a week conducting Vacation Bible Schools and doing construction work. We took a third missions trip in 2003 through the Southeast to Miami, Florida where we served with missionaries Mike and Sharon Keller on the campus of Florida International University. There we passed out gospel literature, sang in several churches, and even sang in one of the university’s auditoriums. The chorale has sung in numerous area churches and nursing homes, as well as for Mr. Truett Cathy at the headquarters of Chick-fil-A. The members of the team are selected on the basis of Christ-like character as well as their musical talents and they serve in the music ministry of Calvary Baptist Church. It is our prayer that you worship the Savior together with us in song.